I've got an EJ trans with 1.59 dual range but the synchros are smashed. The snapring that holds the synchro hub on the shaft slid out of the groove and the brass ring is smashed and the little steel pucks are melted into it. So I need a couple of brass baulk rings (43/42mm tapered bore), steel pucks/shoes, and preferably the big round wire snaprings that hold them in place. I contaced All Drive and they don't have that size in stock. 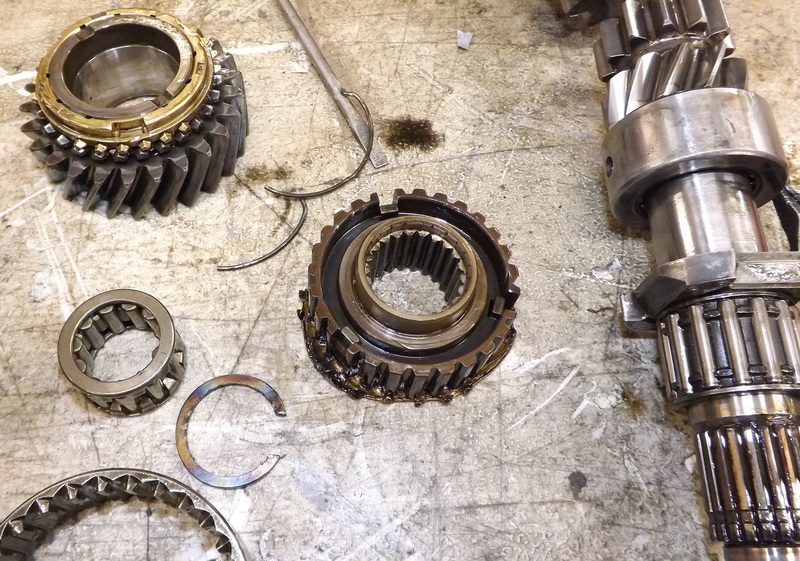 I also need a 27 tooth third gear for a 1.45:1 ratio. You should be able to find them in the US. But you’ll be contending with Brat owners who may be after them for a 5 speed box conversion. Avoid the turbo model gearboxes, they’ll be the crap 1.19:1 low range ratio. Bit of a late reply but I was impressed with the level of destruction.... I'm with Bennie, unless Subaru happens to still stock them (which I doubt) you will be down the route of a second hand box. I would also be concerned with the amount of heat generated having weakened other parts. How long was the box running with the L-Series low range before that happened? Just wondering if it was a shimming issue as if the input shim is to small the synchro rings will rub and could cause this damage. Also how much has been taken off the outside of that synchro ring. Looks like heaps more than I took off. Clearing a 4.44 or 4.11 ring gear? When I first got this transmission that blocker ring was wiped out, not this badly though. I did have to shim the input shaft out to make it spin freely. The selector ring was already turned down when I got the box, it does seem awfully thin but looked like that had to be done to fit in the fork. I did at one point have to replace the ring and pinion and had to grind down the teeth on the ring gear to clear it. 4.11 ratio. The last time it was in my car I put 10,000 miles on it before this failure but didn't use low range a lot. When it failed I had just climbed up a long hill for about a minute in low range. It was a fairly high level of destruction. I think the root cause was the snapring for the hub sliding out of the shallow groove on the shaft. I cut that groove deeper in my lathe and used a different snapring and made some bronze blocker rings with male keys to get rid of those pucks and spring clips. Got it in my friend's Forester now. It is a little noisy and doesn't shift hi-lo smoothly. Since his car is pretty light, has a stock NA EJ25 and fairly small tires we're hoping it will last a long time.